Join us on Saturday, April 20 for the release of Hoppy Honey! 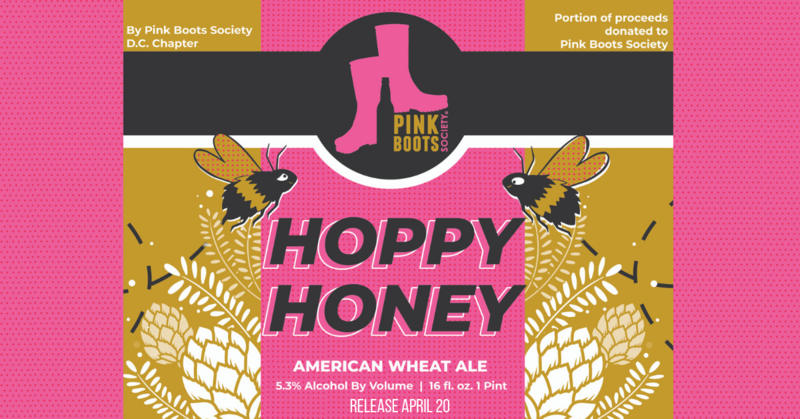 This Wheat Ale was brewed by the Pink Boots Society, DC chapter, on International Women’s Day. Our Head Brewer Allison and Tasting Room Manager Abigail helped with the brewing process. We have our Comedy Show that night and Saffron Gourmet will be here all day! Pink Boots Society is a group founded to enhance and advance the careers of women in the beer industry. This world-wide collaboration day began with a desire by Pink Boots members to take part in International Women’s Day in order to bring attention to the contributions of women in the beer industry. A large portion of the beer sold will be donated back to the Pink Boots Society to help with scholarships that they offers.